This tray will hold 3x Ghostkeel, 6 Broadside, 6 Drones or similar sized models. 3 inch (76 mm) thick tray. 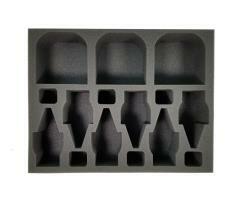 Tray Dimensions - 15.5W x 12L x 3.25H" (394W x 304L x 83L mm). Available through the US warehouse only.